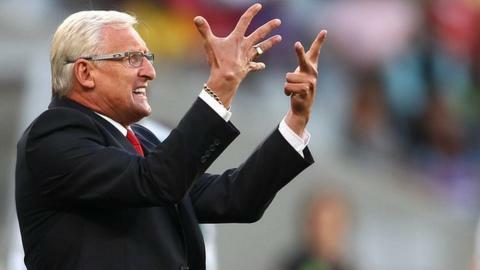 South Africa coach Gordon Igesund sought to project an image of 'business as usual' this week as he named his squad for two friendlies against Australia and New Zealand next month. But the 57-year-old faces a personal D-day next week when an inquiry into his conduct is expected to make a recommendation on his immediate future in charge of the national team - and impact on whether he even leads the squad Down Under at all. As things stand there is already overwhelming speculation he will not be in charge past the end of his contract in June, making the matches against Australia in Sydney on 26 May and New Zealand in Auckland on 30 May his final two as coach. While Igesund explained his squad selection in terms of planning for the future and preparing for the 2015 Africa Cup of Nations, behind the scenes he has been a man waiting for the guillotine for weeks now. Igesund is being investigated by a special commission set up by the South African Football Association (Safa) into allegations he encouraged his players to consider going on strike over bonus payments ahead of their participation in the recent Nations Cup. A five-man investigation team is led by Norman Arendse, a former Western Province soccer boss and cricket administrator, and is set to make public its findings on Tuesday 15 April. Igesund has already denied the allegations but has been unable to shrug off persistent leaks from Safa that he has often been more interested in money than preparing his team properly. "The sooner we get this thing behind us, the better it is for everybody. I'm very pleased that we are going to have this investigation," Igesund said when it was announced. This week he denied the allegations in much stronger terms and accused the media of finding him guilty before the process had been completed. "I expect that kind of thing. People want to sell newspapers. I just wish people would do more investigation rather than just writing stories and making accusations. "There's a hearing, why not wait for the hearing to come out and you'll find out what the truth is. There has been lots of totally unfounded allegations, and the truth will always set you free - and that's why I welcomed the investigation." The coach insists the investigation will clear his name and strengthen his chances of staying on longer in the job but Safa insiders are already claiming a successor will be named in June, just days after Igesund's contract comes to an end. If so that would give the new man enough time to adequately prepare for Bafana Bafana's next major international assignment - seeking qualification for the 2015 Nations Cup finals in Morocco. The qualification matches start in September and six games will be played in less than three months. Even if Igesund is cleared by the commission, it appears his reign will finish with the two friendlies Down Under. It would bring to an end a torrid spell in charge that has included home failure in the quarter-finals of the 2013 Nations Cup and elimination in the first round of the 2014 CHAN tournament for home-based players. He also failed to secure a World Cup finals berth in Brazil with his only highlight being a win over Spain in a friendly international at Soccer City last November.